Good morning to you all. Although not really so good since it snowed very heavily yesterday and quite a lot overnight too! I think we will have to do without a newspaper today because to get to the next village to the shop we have to go down a very steep hill which is rarely ever gritted. It's not worth the risk to get what passes for news these days. Luckily I did my food shop yesterday so the cupboards and fridge are full so we won't starve. Mind you, I'm sure it will soon be gone. Anyway, I cannot believe these two weeks have gone so quickly. March already! It was Zoe's turn to choose our theme and she said to make a card for someone special. Now that is almost an Anything Goes challenge. 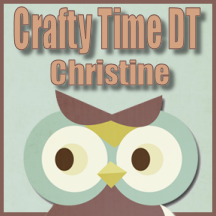 The other girls will be posting tomorrow but I have another DT card due then and I don't like posting two on the same day. topper - Pink Gem "Snow In Love"
I decided once again to use some of the images I got from Pink Gem last year and didn't use. They make really quick cards, and again I made it flat for posting. Take care and keep warm!! We have seen quite a bit of snow...,on our trip to the uk... I don't like it... Yuk!! We've had no snow in Lincs that has settled just wet mushy showers. Keep safe and warm. 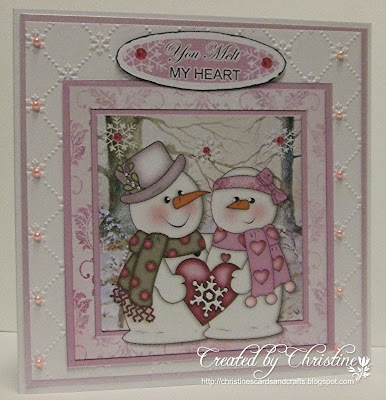 Oh so sweet Christine, I love the image and the colours, just perfect for the challenge. Hi Christine awwww love how you created this gorgeous cute crimbo card with the super embossing folder & PG image, great clean lines..lovely work. Your card is very sweet and adorable. 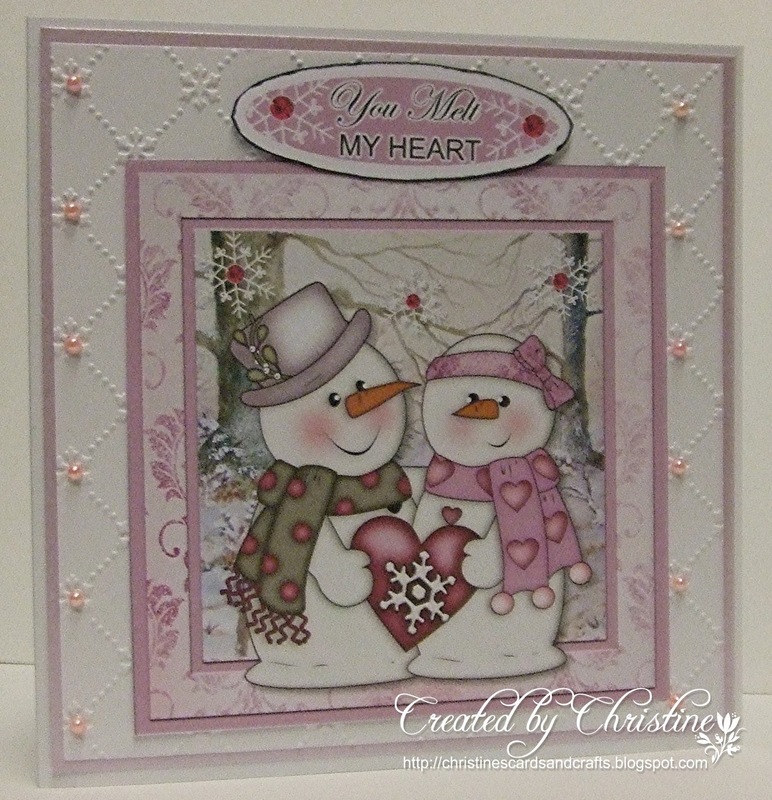 Sweet little snowpeople image and love the way you put the pearls on the embossed design! 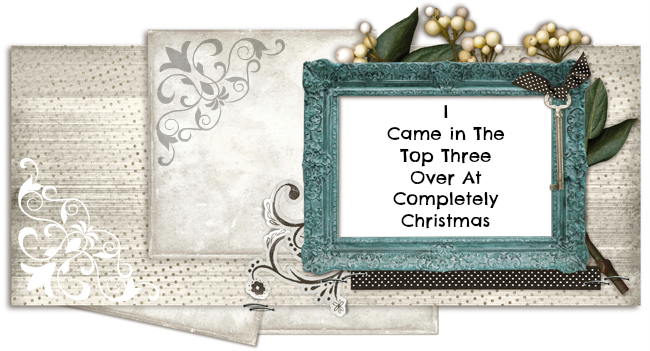 What a gorgeous image and beautifully mounted on the pretty embossed background layer. The sentiment is very sweet too. Hope the weather has improved for you Christine. 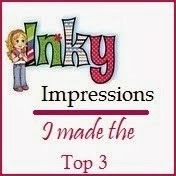 It's a delightful & cute image, and I love that embossing design that you've placed it atop. It's a perfect "Someone Special" image, and particularly the sentiment. Glad that you didn't go out for a paper and chance a fall. Rightly said, the news these days is not worth taking the risk. Hope the snow is melting a bit for you today. Happy Sunday, Mother's Day, and have a great week. 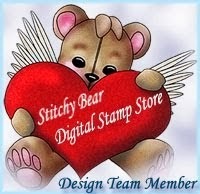 TFS & Hugs. 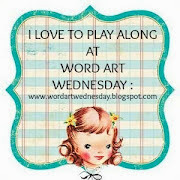 This is adorable and I love the lattice work and that super sentiment. Says it all really. Hugs Mrs A. This is sooooo sweet and I dearly love snow people - you know they say that there is no people like "snow" people! I am green with envy over your embossed background. It seems like all my embossing folders are so small. Your card definitely melted my heart! 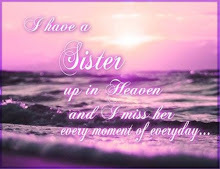 What a super image and sentiment on this delightful card. Yes, we had the snow too but it didn't last long thankfully. Will be in touch at the weekend to sort out our biannual liaison lol!